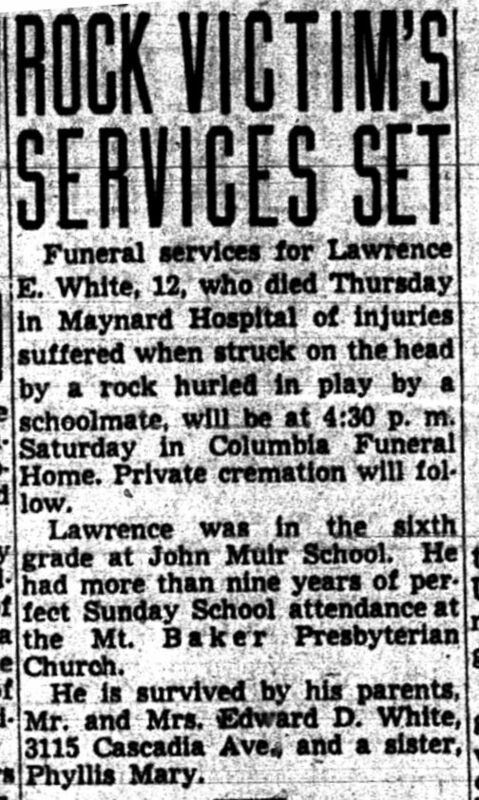 Funeral services for Lawrence E. White, 12, who died Thursday in Maynard Hospital of injuries suffered when struck in the head by a rock hurled in play by a schoolmate, will be at 4:30 p.m. Saturday in Columbia Funeral Home. Private cremation will follow. Lawrence was in the sixth grade at John Muir School. He had more than nine years of perfect Sunday School attendance at the Mt. Baker Presbyterian Church. He is survived by his parents, Mr. and Mrs. Edward D. White, 3115 Cascadia Ave., and a sister, Phyllis Mary. Sedro Woolley — George F. Giesler, a longtime resident of this city, died Thursday in Skagit Valley Hospital at Mount Vernon. Mr. Giesler, 76, came here in 1925 from Tennessee. He was a retired fireman for Goodyear-Nelson Lumber Co.
Services will be Saturday at 3 p.m. at Lemley Funeral Home, with the Rev. W. V. Kononen officiating. Burial will be in Sedro Woolley Cemetery. Survivors include his wife Ellen; four sons, Donald of Sedro Woolley, Charles of Burlington, James of Auburn and William of Seattle; three daughters, Miss Anna Mae Giesler of Seattle, Mrs. Mildred Moore of Bremerton and Mrs. Mary Constance of Ephrata; a sister, Mrs. Rhodie Davis, and a brother, Rod, in Tennessee. Weil, François. Family Trees: A History of Genealogy in America. Cambridge, Mass: Harvard University Press. 2013. ISBN 9780674045835. Family Trees begins by detailing the basis for keeping many of the records that our ancestors kept. He goes on from there to detail the large pictures over the next several hundred years of genealogical research. Weil goes into some detail to discuss how the people and the methods they use are changing over time. The book is well organized. He weaves each major section of the book together expertly and places each major player in their respective time lines: the record keepers, fraudsters, and reformers all have their places. The discussion toward the end of the last chapter is especially pertinent today as it deals with the democratization and commercialization of genealogy and family history research. Weil details the industry and its effect on genealogists. Funeral services for Albert W. Worthen of Los Angeles, former Portland resident, who died on his way to visit relatives here, will be held Saturday at 2:30 P.M. in the Holman & Lutz Colonial mortuary. Rev. Paul G. Dickey of Parkrose Community church will officiate. Commitment will be private at the Portland crematorium. Worthen’s death occurred in a tourist camp in Arcata, Cal. He had been head of the personnel department of Douglas Aircraft company the past three years in Los Angeles. Between 1912 and 1917 he was assistant claim agent for the Portland Electric Power company in Portland. Surviving him are his brother, E. H. Worthen, and three sisters, Mrs. Hazel Walker, Mrs. Etta Kruger and Mrs. Myrtle Harrer. The Oregonian (Portland, Oregon), 8 September 1945, page 7. 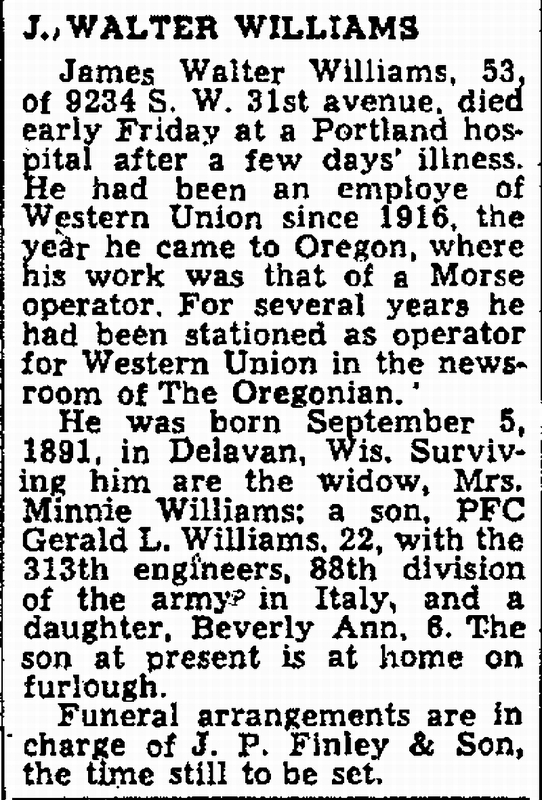 The Oregonian, 8 September 1945, page 7. James Walter Williams, 53, of 9234 S. W. 31st avenue, died early Friday at a Portland hospital after a few days’ illness. He had been an employe of Western Union since 1916, the year he came to Oregon, where his work was that of a Morse operator. For several years he had been stationed as operator for Western Union in the newsroom of The Oregonian. He was born September 5, 1891, in Delavan, Wis. Surviving him are the widow, Mrs. Minnie Williams; a son, PFC Gerald L. Williams, 22, with the 313th engineers, 88th division of the army in Italy, and a daughter, Beverly Ann, 6. The son at present is home on furlough. Funeral arrangements are in charge of J. P. Finley & Son, the time still to be set. I just posted my interpretation of the GDM on Google’s Code Hosting GitHub platform. It is a SQL script to create an empty database. It’s primary purpose is to elicit comments and perhaps criticism from others prior to finalizing the layout of the database and beginning programming on it. I’ve posted a simple vision and scope document to Google Code Hosting GitHub for public review. If you are interested, you can find it through the link. GeneaLogicNG is in the analysis and design stage at the moment so there is no code to be downloaded. I do plan to post some of the SQL materials that I’ve got, sometime soon. I’ll let you know when that happens.